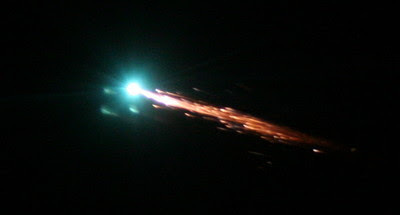 Giant space tug boat "Jules Verne" was used by the European Space Agency to deliver supplies (like oxygen and water) to the International Space Station (ISS), but it descended back to Earth and disintegrated into a fireball at the close of its very successful mission, reports the BBC. Among other notable accomplishments, the Jules Verne was the first robot ship to rendezvous and dock with the ISS on its own. According to the BBC report, at 13.5 tons, the ship was "the largest and most powerful space tug" to service the ISS. The Jules Verne mission was so successful the ESA is considering using similar freighters to take astronauts to the station. Also, such a spacecraft will be used to push the ISS out of orbit for it's final descent, probably in ten years.